« Would You Have Your Guitar Aged? I’ve had this secret desire to own a Rick Turner Model 1 for a long time, though I never really shared that desire with anyone. For the past few years, my focus on gear acquisition has been on electric guitars and amps, with the occasional acoustic thrown in. But a Rick Turner guitar has always been in the back of my mind. So what originally led me to this? Well, one guy in my church band plays one, and another is having one built for him right now. My latest conversations with them have led me to consider having one built. 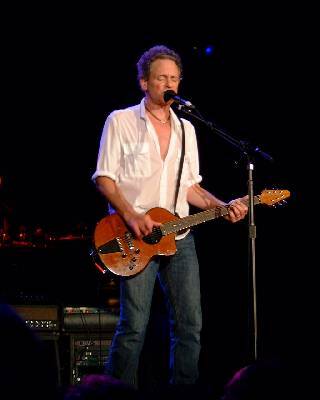 If you’re not familiar with Rick Turner guitars, all you need to do is turn to Lindsey Buckingham of Fleetwood Mac. He has been playing a Model 1 (probably a customized version of it) for years. To me, this is the answer to the hybrid guitar; much more so than the Taylor Tx series. Lindsey uses it for both acoustic and electric, and having heard the guitar live, it does both fantastically well! One of my concerns about hybrids has always been what I feel is the compromise sound, and I’ve always been a bit disappointed in the electric tones of hybrids. But as Rick’s pedigree includes a stint with Gibson development, he certainly gets the electric part. And amazingly, with the peizo pickup, the acoustic tones when plugged in are incredibly natural sounding. Update: Got a price list for the Model 1. I’ll be waiting for awhile, but I think the wait will be worth it. Looks like it will be perfect for what you’re into most. I’ve never tried one so I’ll stick to my hopes of getting an on stage acoustic guitar holder/stand some time…. Like this..
I’ve been looking at getting one of those when I’m doing my church gig. That way I can switch between electric and acoustic. Neil Schon used one didn’t he? I could’ve sworn I saw a picture of him using one back in the day. John, nice!!! Great article! Thanks for sharing it!